"Offers background information, methods of characterization, and applications for electrical and optical polymers, including biopolymers, and tutorial sections that explain how to use the techniques." 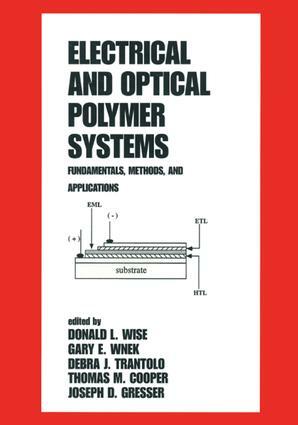 ". . .gives a comprehensive view of characterization and applications of electrical and optical polymers, including fundamentals, methods and applications. Different chapters are focused on state-of-the-eart applications, with tutorial chapters on electrical and optical polymers, with emphasis on commercial polymers." Part 1 Conductive polymers: polyanaline as a corrosion barrier; optimization of electrical and redox properties of electrogenerated polypyroles; heterocycle-based electroconductive polymers; electrochemical characteristics of conducting polymers; anisotropy in electrically conducting polymers; basic methods of synthesis and characterization of electronically conducting polymers. Part 2 Nonlinear optical polymers: nonlinear optical characterization of polymers; conjugated polynitriles - a novel class of nonlinear optical and electric functional polymers; second harmonic generation in poled polymer waveguides using co-propagating geometries; design and fabrication of nonlinear polymer integrated optic devices; fabrication and characterization of electrooptic polymer waveguide modulator for photonic applications. Part 3 Advances in electrical and optical polymer systems: optical and spectroscopic investigations on the supramolecular assemblies of optoelectronic materials; towards organic functional devices using ionized cluster beam deposition method; electrochemical synthesis and characterization of conjugated polymers; optically active conjugated polymers with main chain chirality; coordination polymers - infinite 1-D, 2-D and 3-D frameworks based upon transition metals and polyfunctional ligands; interfacial aspects in the manufacture of soft contact. Part 4 Dielectric and field responsive materials: electrical responses of polymer gels; electric field alignment of polymer materials exhibiting long-range order; ferroelectric liquid crystalline polymers; electrical impedance properties of chemically responsive hydrogels; ferroelectricity and peizoelectric biopolymers. (Part contents).